It is still cold and rainy here in Northwest Ohio. We have been experiencing temperatures in the 50s but another cold snap is on the way. I have a few choices of things to do today. Shooting in the rain is not one of them. I do have rain gear and have photographed in the rain when I needed to, but today is an office day. Tuning up the printer and updating another gallery in my website. Today is Avian Gallery update day. I have added a few images from my recent trip to south Florida as well as past excursions to Alaska and some of my images from right here in Northwest Ohio. One might think that northern Ohio is not much of a mecca for bird photography but they would be wrong. All you have to do is Google the “Biggest Week in Birding” on the web and you will see that the bird migration in the spring attracts thousands of birders and photographers to the shores of lake Erie. It is only a 45 minute drive for me and the photo opportunities during the last weeks of April and into May provide the best birding photographs in the area. People come from all over the world to watch, photograph, and share the experience of the “Biggest Week.” The image that I have posted today is one of my favorites from recent years out by the lake. 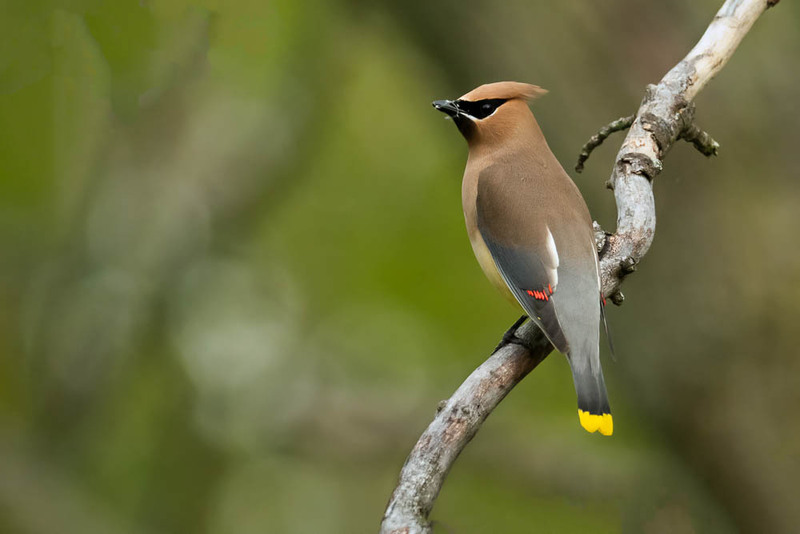 It is a rare sighting of a Cedar Waxwing. The only one I saw all season, but one that stayed long enough for a few clicks of my shutter. Enjoy!